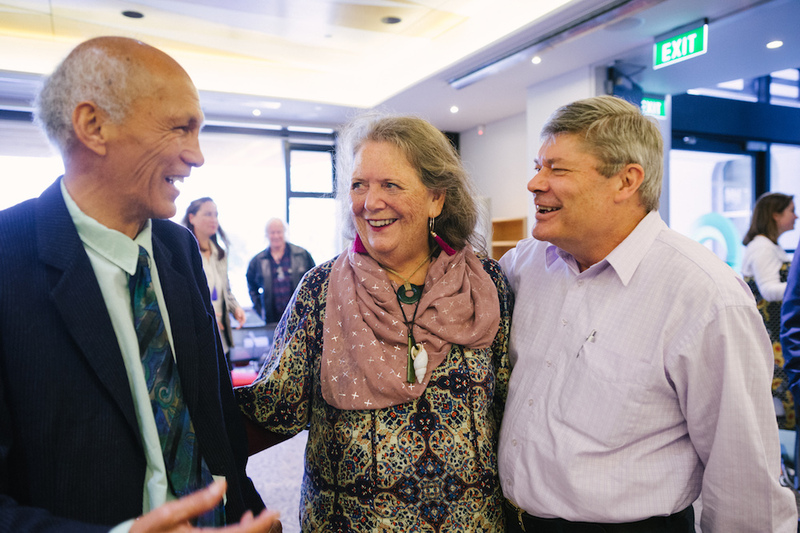 Foundation North trustees and staff honoured departing and new trustees with a pōwhiri at their headquarters on 30 July. Trustee Precious Clark performed the karanga (call) to invite the trustees and their guests into the building, where the Foundation’s kaumātua Kevin Prime, current trustees and staff were waiting to welcome them with waiata and speeches. Deputy Chair of Foundation North, Alastair Bell, standing in for the organisation’s Chair, Huei Min (Lyn) Lim (who is on holiday), warmly paid tribute to his departing fellow trustees and welcomed those coming on board. “Each of our trustees brings a unique perspective to the Foundation, which enriches our debates, and helps us better serve our diverse populations and not-for-profit sectors. Our newcomers join a team of trustees with a genuine commitment to providing quality governance of this perpetual asset for our community,” said Mr Bell. Three trustees; Moe Milne ONZM, Auva’a Unasa Enosa Auva’a and Mark Brickell ended their terms with the Foundation and were presented with a bespoke taonga from Kim Wright, chair of Foundation North’s Māori and Pacific Committee. Ms Wright praised exiting trustees for their unique contributions, and the persistence, hard work and genuine passion each had shown for the Foundation’s vision over the years, and particularly for their guidance during the development of the Foundation’s new strategies for Māori and for Pacific communities. Four new trustees, appointed by Associate Minister of Finance, Hon Dr. David Clark, joined the organisation’s governing board on 1 July 2018. They are Brian Corban, Ngaire Rae, Michelle Tsui and Romy Udanga. A fourth place had become vacant due to the sad passing last year of Bill Plunkett, whose long and steadfast contribution to the governance of Foundation North was also acknowledged at the event. To see more photos go to our Facebook page.